I’m very excited to be able to share with you today that I am the June Flourishes Limelight Designer. I’m so tickled to work with the ladies from Flourishes and look forward to spending my Sundays with them this month! Here’s my first card I posted for Flourishes. You can find out everything I talked about by visiting the Flourishes Newsletter! Oh my BADNESS, it’s Friday night already! I’ve spent the entire day rolling that fabulous May Arts Ribbon (that isn’t up on the Rubbernecker site yet, but will be very soon) that we got over the Dallas Weekend and just generally putting stuff away. Oh and I also fell to the pressure and joined Face Book. I never thought I would, but I got an email from a high school friend. Now this is really cool chatting with high school friends! When I was walking around the yard the other day, I noticed the lilacs budding out. I hope we don’t get that snow they are calling for so I have some blooms this year. 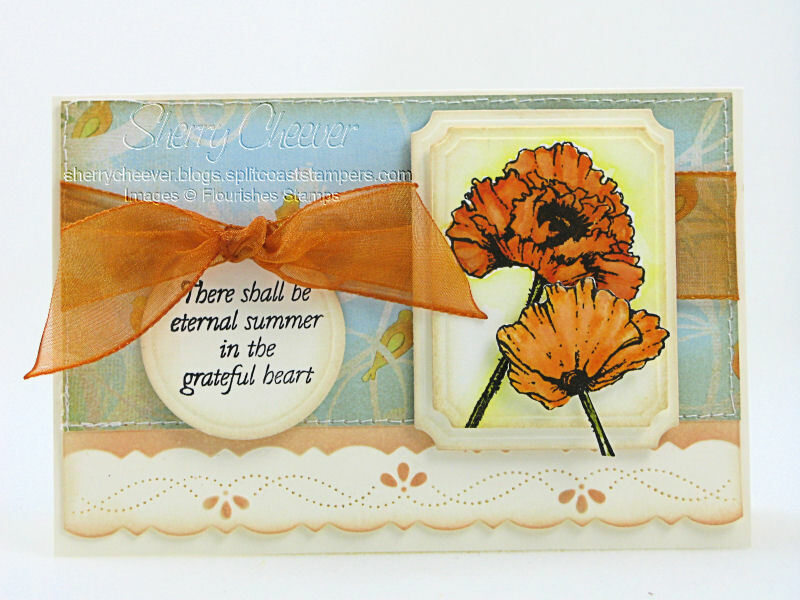 Last night I was so inspired by the spring growth in the yard that I had to make this card. Well I started it last night and finished it this afternoon. I did something that I haven’t done in a very long time with this card. I pulled out my SU Markers and colored the lines of the image, misted the ink with water and stamped on watercolor paper. I then took lighter shades of markers, colored over the marker and worked them around with my NEW Koi Water Brushes. How I love these Kois. It may keep me from ever using a regular brush again. The edges of all the paper and the image are lightly sponged with Antique Linen Distress Ink and then sewn to the cardstock base. 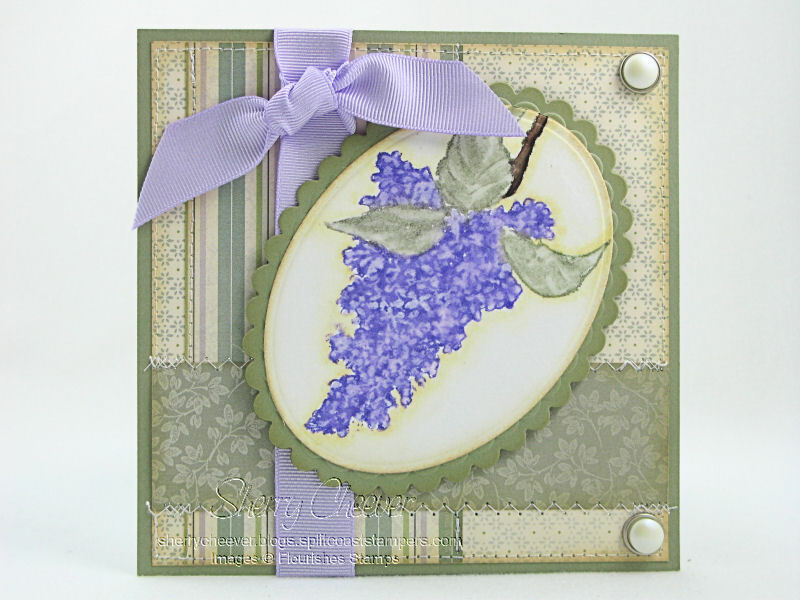 The image and scalloped layer with cut and embossed with Spellbinders Petite Oval Nestabilities. I hope you’ve had a good Friday and it continues into the weekend for you. New stuff is coming next week so you’ll want to pay close attention! I hope y’all have had a good weekend. My girls finally headed back to school this morning around 10:00. I enjoyed the noise and all the commotion while they were here, but I’m also glad to be able to get back in my studio. As I was reading through my daily blogs this morning, I noticed the CPS Sketch Challenge. Something about the sketch caught my eye and I knew I had to give it a try. So after I had read the Sunday paper, talked on the phone for a bit, and had all my coffee I headed down to the studio. 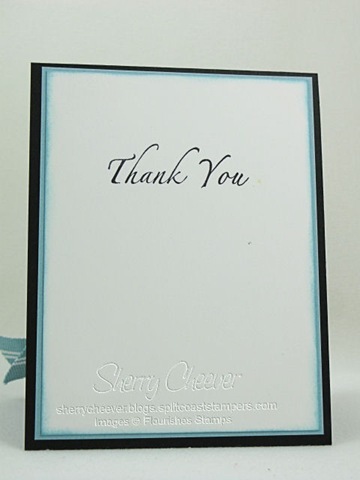 Instead of making a long card as the samples on CPS, I made mine 5.5″ x 3.75″. I just noticed that the CPS Sketch is sponsored by Our Daily Bread this week. I think I’m gonna have to make another using Our Daily Bread images. I die cut, embossed and then stenciled the bottom border first. Using the same paper, the background paper was sewn to the top portion. The poppies were water colored with Ranger Distress Reinkers and the second was cut out and raised on foam tape. As I was looking for ribbon to match, I found this scrap piece that I believe came from a box of candy. Thanks for stopping by. I’m gonna get ready for my Sunday night television shows . . . don’t ever want to miss Brothers and Sisters! I’ve actually made two cards today . . . WOO HOO! I so wanted to do the SCS Sketch Challenge today, so after my nap I jumped on it. Hehe – yep got that afternoon nap in. But sssshhhh, don’t tell anyone! Since I’m watching American Idol while I’m writing this post, I gonna get right to it. I loved the sketch today because it is perfect to incorporate inchies with. You know I do love to make inchies. 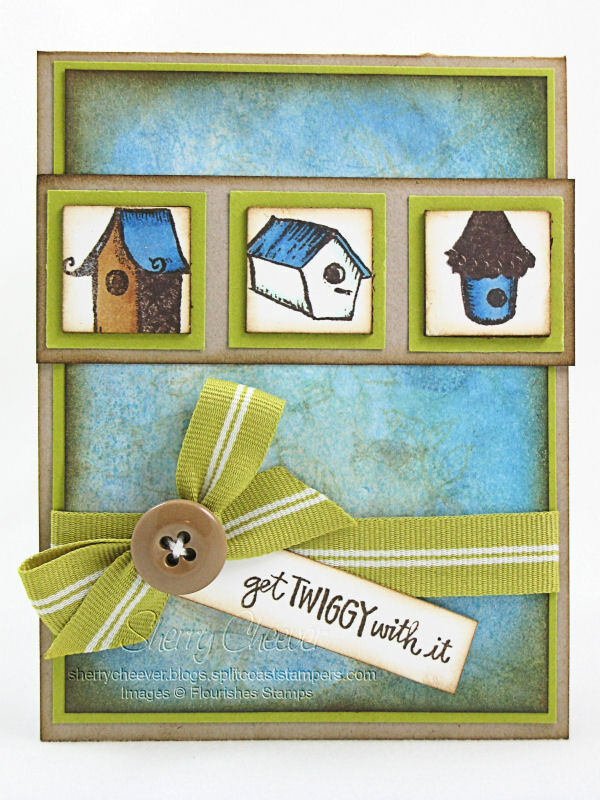 When I saw the Home Tweet Home set from Flourishes, the first thing that went through my mind was what I could make inchies with from the set. I’ve been wanting to work with the birdhouses in this set and today I got to do it. The inchies were colored with Copic Markers, punched out using a 1″ square punch and then mounted on 1″ illustration board. While I was at Hobby Lobby one day, I found in the artists section a package of ATC cards made from illustration board. Today I cut one of the ATCs up into 1″ squares so that I could glue the paper inchies on them for more stability. The background paper is made with that “inky thing I do” by swiping distress pads on a craft sheet and misting with water. Even though it is hard to see in the photo, I misted the paper with Broken China/Gold Distressed Pearlized Mist and then stamped the branch from the stamp set in Antique Linen. I hope you had a great day today and thanks for stopping by!